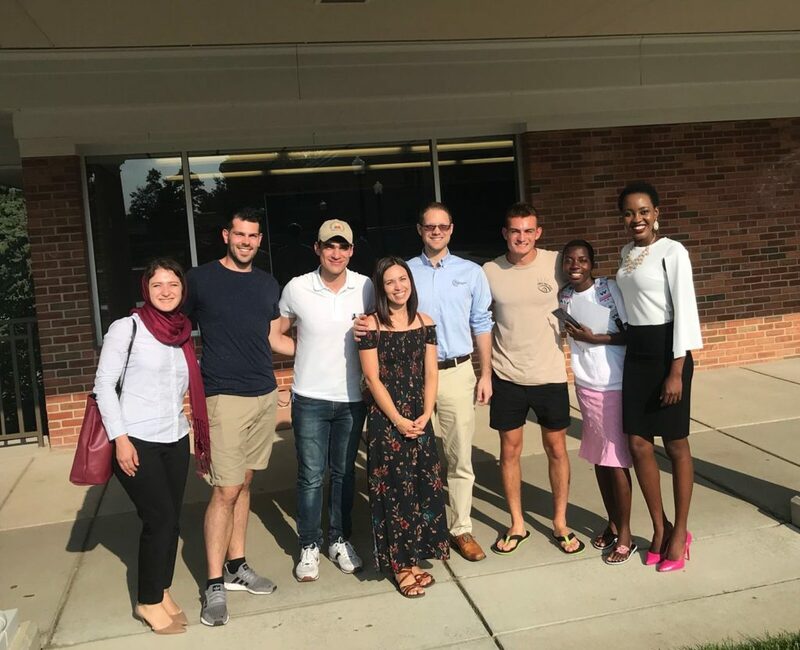 A group of Hillsdale’s 2018 inter­na­tional stu­dents outside Mossey Library. On the patio of the New Dorm last week, the inter­varsity of inter­na­tional stu­dents gathered around a hearty bonfire, roasting s’mores and chatting about their week. Former Kenyan student Monicah Wanjiru ‘18 started the min­istry group in 2015 after meeting an inter­na­tional student who felt very alone and wanted to leave Hillsdale — a place where it seemed that no one under­stood her and that was more reli­gious than she was used to. The inter­varsity is growing more popular and well-known as sopho­mores Sofia Krusmark and Emille Martelli strive to foster global rela­tion­ships on campus and explore new events for campus this year. Inter­varsity staffer Griffith Brown ’17 said the group part­nered with Coun­tryside Bible Church and pre­sented the stu­dents with care packages filled with the basics — towels, blankets, toi­letries, and contact infor­mation. They are hoping to schedule more events like the bonfire as well as give them options for Thanks­giving, fall, and Christmas breaks. Although the inter­varsity cul­ti­vates a Christian outlook and mission, Martelli said the primary focus is devel­oping authentic friend­ships. Krusmark agreed, saying that though they want to connect the stu­dents with Chris­tians on campus, they believe that getting them settled and inte­grated into Hillsdale is the main goal. Inter­varsity approached Krusmark and Martelli about lead­ership oppor­tu­nities for the inter­na­tional stu­dents’ group, and both found that they had per­sonal con­nec­tions with the group. Krusmark’s mother is from Chile so she grew up in a mul­ti­cul­tural envi­ronment where she ate His­panic food and had people come unex­pectedly to her house at late hours. Martelli dis­covered her passion for inter­na­tional rela­tions over the summer when she went to Jordan to teach English to Syrian refugees with the English Lan­guage Institute of China, a program ded­i­cated to sending Chris­tians to Asia to teach English as a second lan­guage. Through the ELIC program, her teaching team met the locals, refugees, and other teams. The inter­na­tional stu­dents appre­ciated the goal of the min­istry group as well. Kenyan freshman Rachael Kiti said she joined the inter­varsity because it was non­de­nom­i­na­tional and would assist her faith. Vargas Her­nandez said he loves sharing his Colombian culture and learning about others’ cul­tures as well. Both Krusmark and Martelli hope to show the inter­na­tional stu­dents how much they love and care for them. For Krusmark, it is important to display the same kind of love Christ dis­plays.